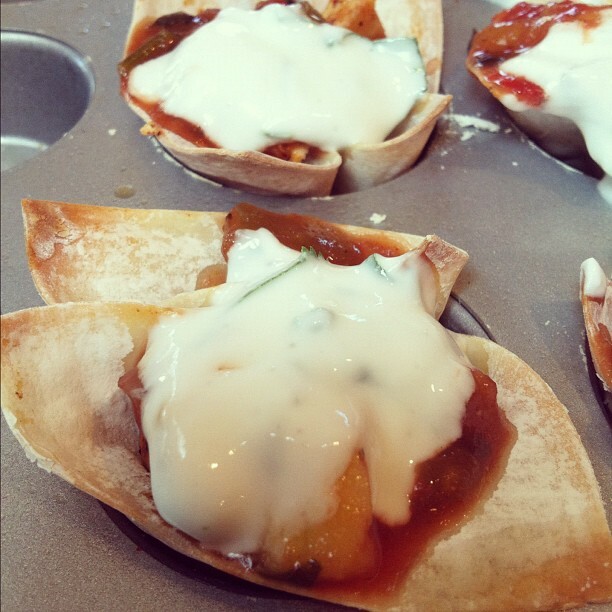 Just Keep Sweating: Mango-Peach Chicken Taco Cups! That recipe title is quite the mouthful...pun intended! Here is the breakdown of ingredients and directions...I apologize for the lack of pictures, I just forgot because I was so focused on filming...I think I need a camera crew, an assistant and possibly a body double for the next one. Bake for 5-6 minutes...make sure you really watch them so they don't burn! While the chicken and taco cups are cooling it is time to make the dip! In a small bowl (I used a cereal bowl as you can see above) combine yogurt, lime juice and cilantro and mix well. Once everything has cooled it is time to assemble!! Place chopped chicken in the bottom of your cup, then top with a little mango-peach salsa (or salsa of your choice) then add a dollop of dip! These were a HUGE hit in my house and I will definitely be making them for a Cinco De Mayo appetizer! If you make this recipe, tweet-email-facebook pictures so I can add them to the "Sweaties" section! Yummmm I will be making these for our friends this weekend for sure! Thanks for posting the great recipe! Oh yay! Please let me know what you and your friends think--good or bad i'd love to hear feedback AND send me a picture! !